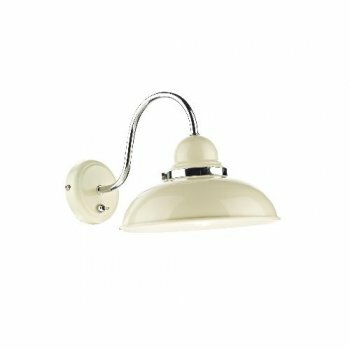 Dar Lighting Dynamo single light wall fitting is a salute to a by-gone era with it's glossy cream domed shade and polished chrome detail. The product code for this Dar wall fitting is DYN0733. Double insulated and comes complete with a toggle switch situated on the wall plate. The Dynamo is a well designed collection with a true retro feel, enabling you to create a co-ordinated look with table lamps and a variety of ceiling fittings included in the range.